The alumni of at least 32 Philippine universities last week participated in the biggest sporting event for Filipinos based in Singapore. The Oblation Cup Inter-Collegiate Badminton Tournament, which requires players to represent their schools back home in the Philippines, classified the 218 players into two categories—men’s doubles and women’s doubles—and three skill levels. Along with the alumni, volunteers and local and foreign enthusiasts also joined the competition, which was held at the Singapore Badminton Hall on October 7. 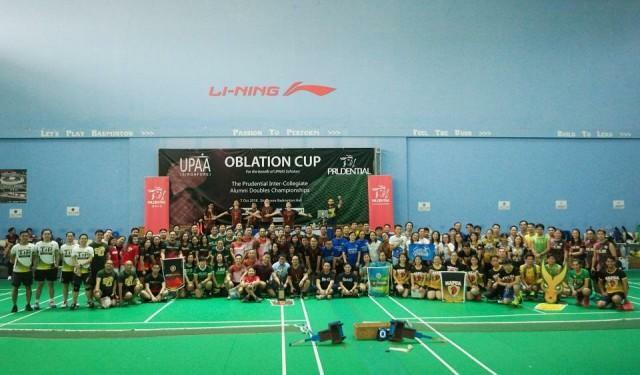 A partnership between the UP Alumni Association Singapore (UPAAS) and UP Alumni Badminton Team–Singapore for the benefit of poor but deserving scholars from the Philippines, the Oblation Cup received wider support from the Singapore community in just its second year. “We have  schools who participated in this year’s Oblation Cup. Last year we had 24. We were surprised as this is only our year two and sumobrang dami yung mga tao,” said UPAAS president Anthony Meriel Garcia. Garcia added that they were happy they were able to tap groups such as their partner UP organization in Singapore for support. What drives the organizers and OFWs who supported the event is its cause-oriented nature. “So ‘yung makukuha naming funds dito, ‘yun ‘yung ipapang-support namin for the scholars. Every year, we support four scholars: one first year, second year, third year, fourth year. So when the fourth year scholar graduates, we will get another freshman. That’s every year. But then they have to prove that they’re deserving, they have maintaining grades and other requirements,” Aguirre said. Polytechnic University of the Philippines (PUP) was named overall champion with the highest standing among all levels, unseating 2017 overall champion Mapua Institute of Technology (MIT) by a small margin. This year, they also introduced a social media contest for the wittiest school “love plug,” which gained a lot of attention and were widely shared within the Singapore-based Filipino community.